Green meadows, paths to explore, and traditional Alpine huts ready to offer hospitality. In summer, Val di Fassa is a favourite destination among those who love the mountains; whether they are expert climbers or simply wish to enjoy the breath-taking panoramas that only the Dolomites can offer. There are many paths to follow in your discovery of these fantastic places, suitable for all requirements. There are strolls that are perfect for families with small children and prams, or treks that last from several hours to multiple days. Do you prefer the thrill of rock? There are many via ferratas to choose from, from easy to challenging. For the most difficult paths, visit the Alpine Guides, who will advise you on how to enjoy your excursion safely. The climb will be tough, but the breath-taking panorama will reward your efforts. Recharge with a tasty snack in the many traditional huts and chalets offering refresHotel Malderent that you will find along the route. The descent will be even more enjoyable after a slice of strudel or a yoghurt with forest fruits. 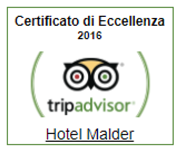 For your holiday discovering the Dolomites, choose Hotel Malder, perfectly located for exploring Val di Fassa. Furthermore, you will have access to many facilities for you active holiday. In summer, bikers visit Val di Fassa to challenge themselves on its MTB trails. From the easiest on the valley floor to more complex trails where you can have fun on two wheels and reach the summit of the Dolomites. During the season, you can attend all the competitions that take place here. From the famous Sellaronda Hero Dolomites, which takes place in June and sees two-wheel enthusiasts crossing the 4 passes on their mtb, to the Val di Fassa Bike, one of the most anticipated events of the season. Bikers face an especially challenging course dominated by the steep climb of Alpe Luisa, 8km with an elevation gain of more than 1,000m. Come to Val di Fassa and sample the thrill of this sport for yourself!